Nissan Motor Manufacturing Sunderland – the Largest Plant in the UK. 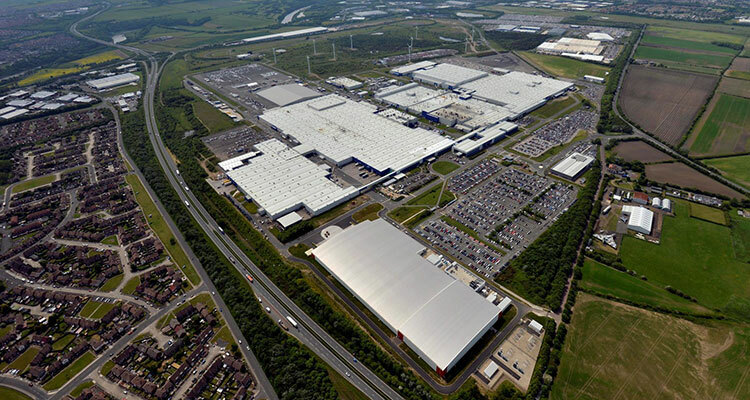 Nissan’s Sunderland manufacturing plant is in the news again; more often than not it’s usually positive news that emanates from the vast plant in the north east of England – but not this time. Nissan has stated that the new X-Trail will not now be built in the UK after initially announcing that it would in 2016. That uncertainty is quite possibly illustrated by Nissan’s decision to reduce the initial upfront costs and logistics of moving an entire vehicle’s manufacturing base, and simply keep on manufacturing the X-Trail where it has always been built. 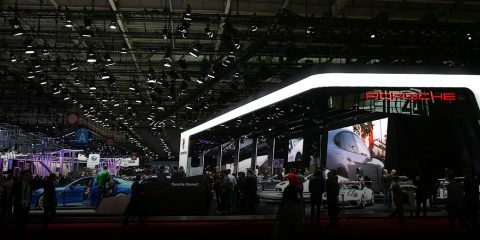 One thing is for certain, the UK new car industry has joined the motorcycle industry in hitting a bit of a low point; new car sales have dropped by 7% – the largest decrease since 2008, with falling consumer confidence being suggested as the reason. To illustrate this clearer, in 2018, 2.37 million new cars were sold, which is 174,000 less than in 2017 (according to SMMT figures). When I worked as a manager within Nissan, I was fortunate enough to be invited up to the Nissan Sunderland Plant on several occasions, mostly meetings, but sometimes – and initially – for the factory tour. What could be less fun than a tour of a factory, we thought – instantly picturing something filthy and Dickensian. Yet nothing is further from the truth. 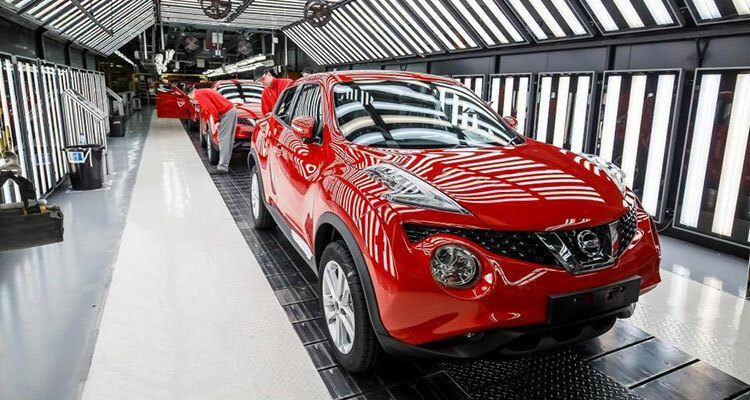 A Nissan factory tour is an eye-opening and enjoyable experience. The plant opened in 1984, built on the former site of RAF Usworth in Tyne and Wear. By 1992 the total investment in NMUK was £900 million – by far the biggest Japanese investment in Europe – and the size of the plant was 799 acres (3.23 km2 or just over a mile squared) situated conveniently just 5 miles from the Port of Tyne. 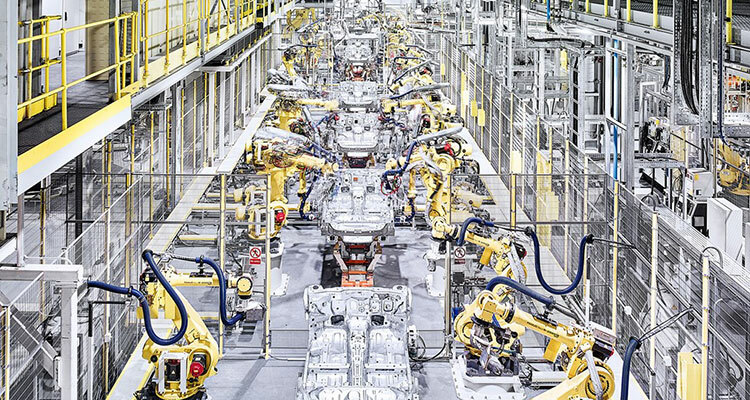 Today, the plant is simply huge at 362,000m2 (around 50 football pitches) and is the UK’s biggest car plant, churning out 1,300 motor vehicles a day. Around 7,000 people work at the plant and the support structure includes a further 40,000 jobs across the UK – and this doesn’t begin to cover the companies that work in unison with the plant from around the globe. At this point, you begin to understand why there is so much passion and fear when a company the size of NMUK decides to change its mind, even though it’s not actually pulling any vehicles but simply not adding any new models to the production line. When we first arrived at the Nissan Sunderland plant, my first reaction was to think that this must be what it would be like to be coach driven into Area 51 in the Nevada Desert; the scale was like nothing I’d ever seen before. The factories I was used to seeing were buildings within a town – this was a town itself. 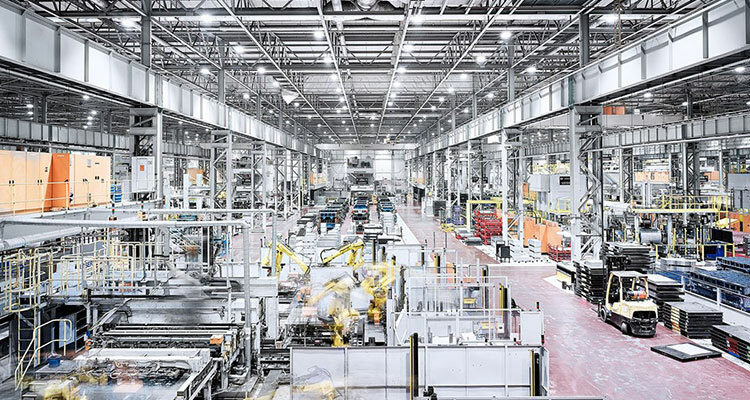 The next thing we noted (instantly sweeping away that Dickensian image of a factory) was just how clean the plant was – all shiny and new looking, with every part moved on a giant conveyor belt system to where it needed to be. In short, the tour was fantastic. It was stressed to us that one little hitch and the entire production line prior to the problem had to stop – and this cost money. We saw workers ready to take over as one shift started and another ended, like a relay team. Nothing, it seemed, would stop the constant motion of the plant. This is not the only rotation principle in operation, as each worker is trained to be able to do 3 different jobs within the factory – not only does this avoid monotony, but it also helps in staffing emergencies should any arise. 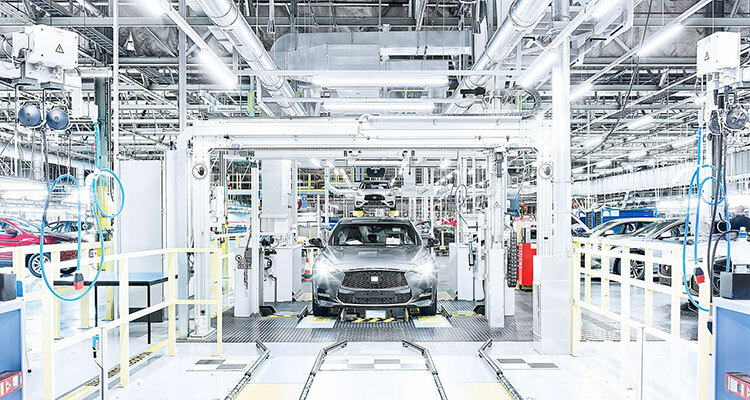 Despite being so huge, the plant doesn’t build everything itself and still relies on parts coming in from across the UK and abroad, where affiliated manufacturers and fellow Nissan factories provide parts to keep the Sunderland production line rolling. We were told that timing is crucial here – parts could be designated to arrive in port for use that very day. One of the most curious things was being made aware of a series of small coloured lines which indicated the paths for small robots to speedily ferry small parts from one section to another – we were jovially warned to watch out for these and not obstruct their path… Lunch was in a large refectory, where the workers and managers alike all sat together to eat; part of the Japanese culture of striving to maintain equality among the workers. The factory also operates under ‘Kaizen’, a Japanese word that roughly translates to ‘continuously improving’. This encourages all workers to seek out and make improvements – however tiny – to the workflow for the benefit of the whole process. It’s a very similar idea to the one that Team Sky embraced to get itself to the level of being serial Tour de France winners – no improvement is too small. It has been said that if the Nissan Sunderland Plant was suddenly not there one day, that it would be akin to the closing of the mines during Thatcher’s time in power, such is the impact that it would have on the working community of the North East. Again, this gives a bit of perspective as to why Nissan not building the X-Trail in the UK raises so much concern. 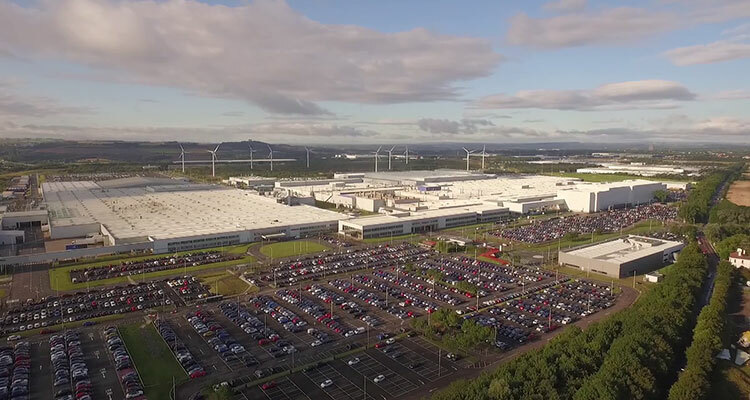 While it might appear to be a little hysterical in some quarters of the press, having stood on the open windswept land of the massive factory town that is the NMUK Nissan Sunderland Plant, I can say that it does give you a different, and sympathetic perspective compared to those that have never witnessed the size of this place with their own eyes. If this has made you curious to experience a NMUK factory tour yourself (the tour is normally conducted in two sessions, one in the morning and the second part after lunch) then I can highly recommend you do so.